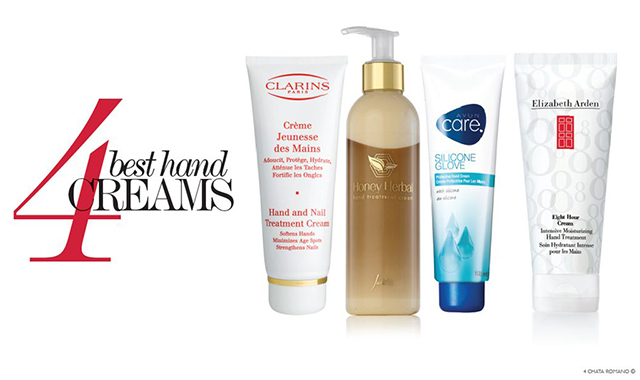 Keep your hands soft to touch as we round up the best hand creams for winter. Full of nourishment for your skin, these luxurious lotions put back what the harsh winter air takes out. CLARINS HAND AND NAIL TREATMENT CREAM: A, natural, moisturising cream which protects skin against chapping and irritation. Your hands are left feeling feel soft and supple and your nails become stronger thanks to extracts of Sesame, Japanese Mulberry and Myrrh. JUSTINE HONEY HERBAL HAND TREATMENT CREAM: A unique blend of some of the finest oils from nature combined with humectants and emollients which deeply moisturises your hands. Natural extracts include horsetail, rosemary, yarrow, chamomile and witch hazel which leaves hands feeling soft and nourished. AVON CARE SILICONE GLOVE PROTECTIVE HAND CREAM: Continual and lasting gel protection against skin irritants. Embraces hands in a silicone rich, non-sticky formula that keeps in moisture and blocks out dryness. ELIZABETH ARDEN EIGHT HOUR CREAM INTENSIVE MOISTURISING HAND TREATMENT: An award-winning hand cream that moisturizes your hands for up to eight hours. This fast-absorbing, non-greasy cream smoothes out rough, weather-exposed skin, reverses signs of dryness and leaves your hands soft once more.